This is a Book I just love the design of. I like the illustrations because they are so clean and mod and graphic all at the same time. The pallet also appeals to strongly to me. 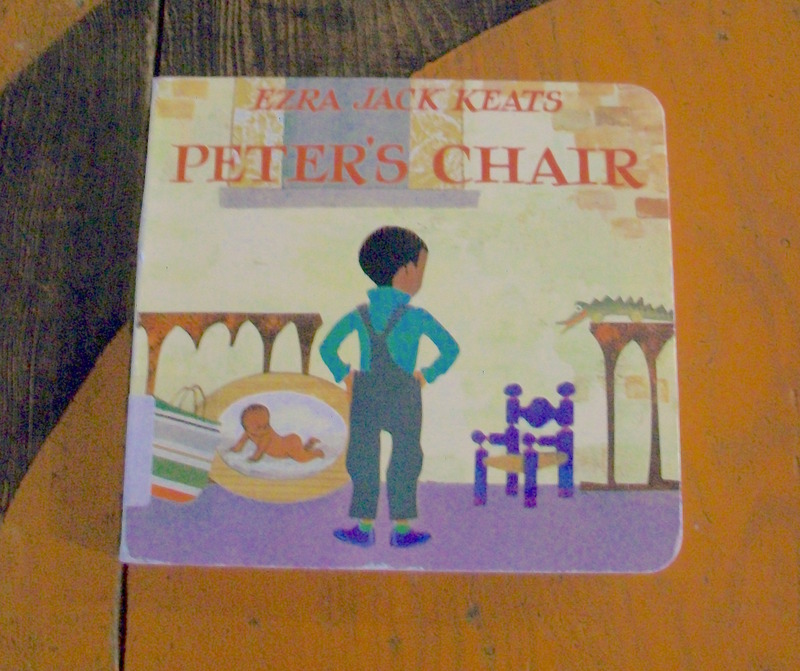 It is called Peter’s chair by Ezra Jack Keats. Peter is well aware that there is a new baby in the house. His mother shushes him when he makes his tower of blocks fall. And he’s also well aware that the new baby’s a girl. For everything that used to be Peter’s has been painted pink! His old cradle is pink, his old crib is pink, and he discovers his father is in the middle of covering his old blue high chair in pink paint. Finally, he discovers his old chair that has not yet been touched: “They didn’t paint that yet,” Peter shouts. Swiftly, he carries it to his room and makes plans with his dog, Willie, to run away with the chair. Once outside, he tries his old chair for the first time in a long time. He’s too big! With a new attitude, Peter returns to his house for lunch and sits with his family in a grown-up chair. But will Peter’s old chair be painted pink? Like Keats’ Caldecott Award-winning The Snowy Day, Peter’s Chair features a young African-American boy who suddenly finds his world transformed. Keats gives us another understated story of how a child quietly comes to accept change. And in his signature, modernist style, Keats also provides the bright cut-paper collage illustrations.